For the boys' team, this spring will mark the first season of varsity competition. After playing two successful seasons of JV lacrosse, the team is ready to take its game to the next level. Leading the Knights will be captains Mike DelPriore '16, Kevin Brito '17, Nick Cooper '17 and Will Dadouris '17. Reflecting on the team, Coach Brian Callanan offered "The squad is young, but well disciplined. The emphasis on tenacity and team work will be keys to producing a rewarding season." 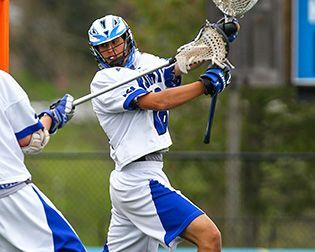 In their first-ever varsity matchup, the boys posted a 22-1 victory over Edison at home on April 5. Leading the scoring were Brito, DelPriore, Ryan Turse '18 and Cameron Burns '17. Dadouris contributed seven saves. Taking the lead for the girls' squad will be captains Caty Matthews '16, Katie Williams '17, Emma Dean '17 and Jennifer Lowe '17. Key players in this spring's lineup include midfielders Dean and Mia Kirby '18, attack and draw specialist Ava Diggins '18 and goalie Katherine Loudis '18. The team has only one freshman, a very talented Andree Aloise, who will be expected to take on an increasingly significant role as the season unfolds. The girls will play 18 regular season games this spring and will officially join the conference in 2017.